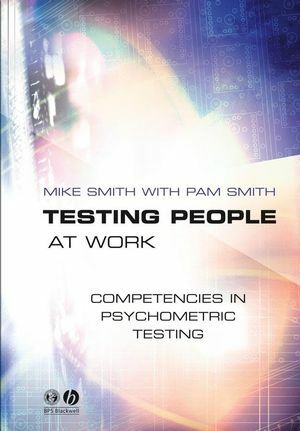 Testing People at Work is an authoritative, practical text on selection and assessment. It explains psychometric testing in occupational settings and also covers other methods of selection such as assessment centres and e-selection. The book systematically covers all the topics required for the BPS Certificates of Competence in Testing Levels A and B. Designed for students taking selection and assessment courses. Covers the whole process of testing, from job analysis to reporting results. Uses new theoretical frameworks for the topics of personality and motivation. Features an extensive discussion of ethics in selection and assessment. Includes questions testing understanding and suggestions for further reading. Incorporates many tables and diagrams giving practical help to users of psychometric tests. Accompanied by supplementary online material, at www.blackwellpublishing.com/testing/. Mike Smith is based at Manchester Business School. His previous publications include Personnel Selection and Assessment: Individual and Organisational Perspectives (co-edited, 1993), Advances in Selection and Assessment (co-edited, 1993) and Analysing Organisational Behaviour (edited, 1991). 1. Competence in Occupational Testing. Part I Preparation for Testing:. 2. Job Analysis and Person Specifications. 3. Introduction to Intelligence & Cognitive Ability. 5. Introduction to Motives (Needs, Interest and Values). 9. Sensitivity of Selection Measures. 10. Standard Error and Reliability. 13. Calculating the Sterling Value of Selection (utilities analysis). 14. Choice of Selection Methods. 18. Other Scientific Methods of Selection. 26. Ethics and Data Protection. If you are unable to view the Word document, you can download the free reader from Microsoft. An authoritative, practical text on selection and assessment. Explains psychometric testing in occupational settings. Covers other methods of selection such as assessment centres and e-selection. Systematically covers all the topics required for the BPS Certificates of Competence in Testing Levels A and B.